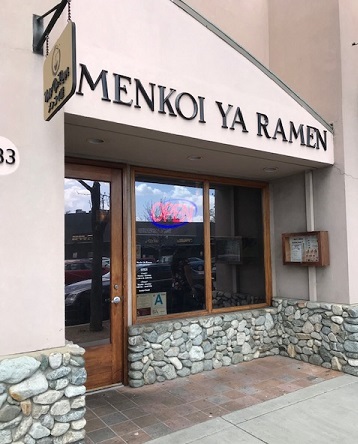 Menkoi-Ya was the first ramen specialist in Claremont, opening in January 2018 in the former Full of Life Bakery storefront. 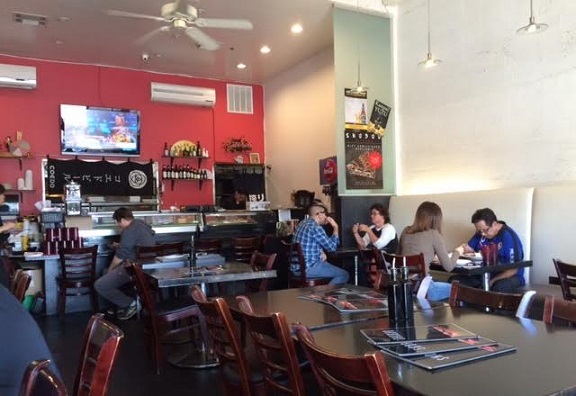 Since then, Ramen Lounge has opened a block away. 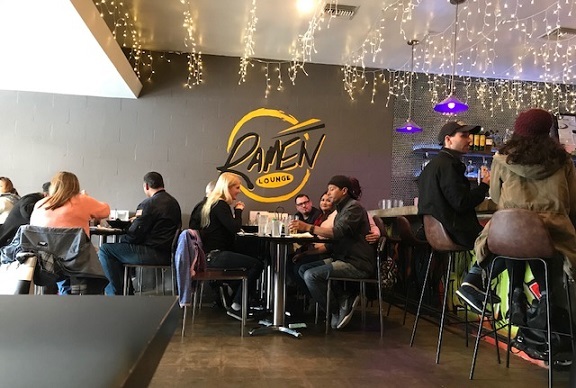 I liked Ramen Lounge fine, even if the skater decor and casual service would repel a ramen purist. Having been there, it was time to try Menkoi-Ya, which I did during my recent staycation, walking in for lunch one early afternoon. (Note the hours above; they close between lunch and dinner.) 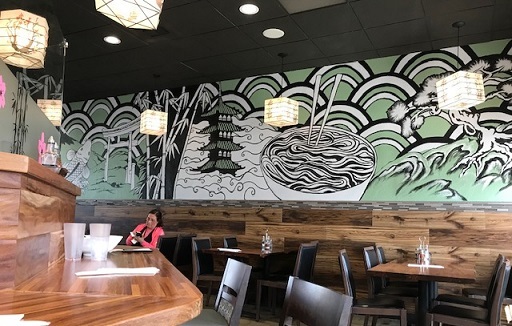 It’s a much more traditional environment with paper lantern-like lampshades, forest green walls and a wall-length mural. The music was modern alternative pop, but not too loud, and service was noticeably calm and polite. 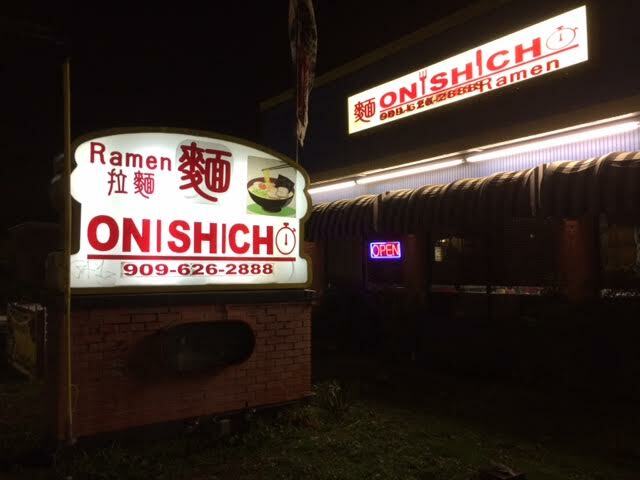 The menu has appetizers, rice bowls and nearly a dozen styles of ramen. Most have a pork broth, but there are a couple of vegetarian versions. 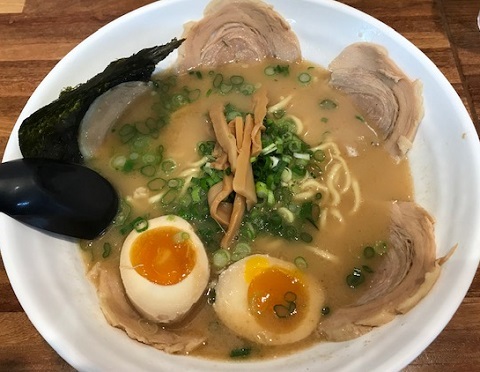 I got the house Menkoi Ramen, with pork broth, shoyu base, toro chashu (slices of housemade pork belly from a sort of loaf), takasuimen noodles, green onions, dried seaweed and bamboo shoots ($8.50), plus a soft-boiled egg ($1). 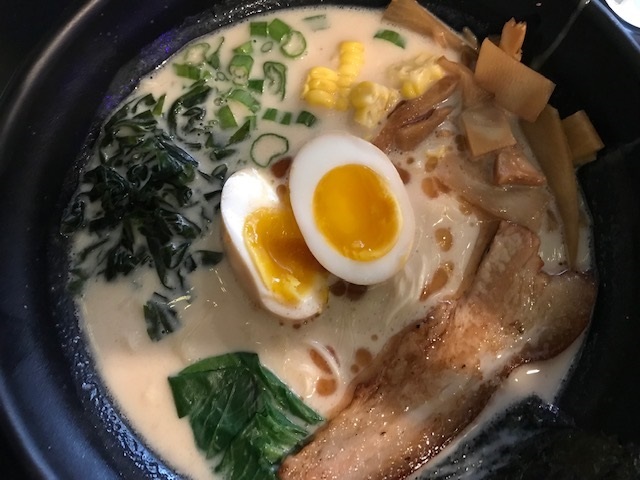 The broth was subtler than at Ramen Lounge, and the noodles, made fresh, are stretchy, chewy and crinkled. 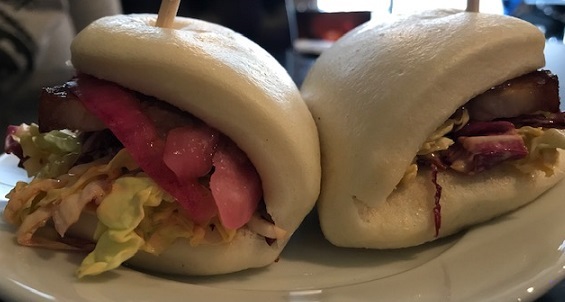 For all I know the chashu was excellent for its type, but I didn’t think the pork added much to the experience, and I’m a pork fan. Still, this was a tasty, filling bowl of ramen. One advantage of sitting at the counter, as I did, is that you can’t be observed fumbling with your noodles or chopsticks. In fact you’re looking at a short wall, unlike at an American-style counter. I actually handled the noodles fairly well. Having been an occasional customer at Full of Life, I recognized that where I was sitting was essentially where I used to stand to place an order of breakfast granola. Ah, nostalgia. 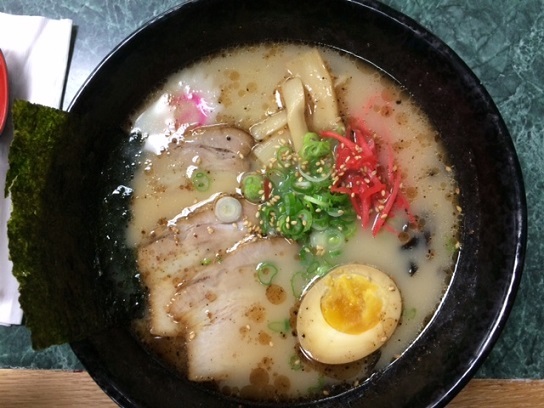 I liked Menkoi Ya and would return, in part to try one of the rice bowls but perhaps for another bowl of ramen. B & F Japanese Restaurant, 3495 E. Concours St. (at Haven), Ontario; open for lunch and dinner weekdays, dinner only Saturdays and closed Sundays. B & F is in a plaza off Fourth and Haven not far from our office, and a colleague had said something nice about it recently. When a friend who once lived in Japan wanted to meet for lunch, I suggested B & F.
The plaza is less visible than before due to the apartments that went up on the southwest corner — it used to be visible from Fourth — but then again, the center suddenly has a few hundred neighbors instead of an empty lot, and that’s gotta be good for business. 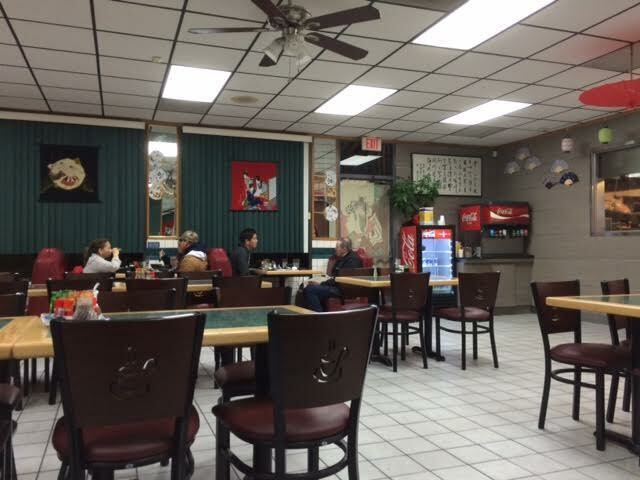 The restaurant is medium-sized, sushi bar off to the right, dining room to the left. We sat in the dining room. 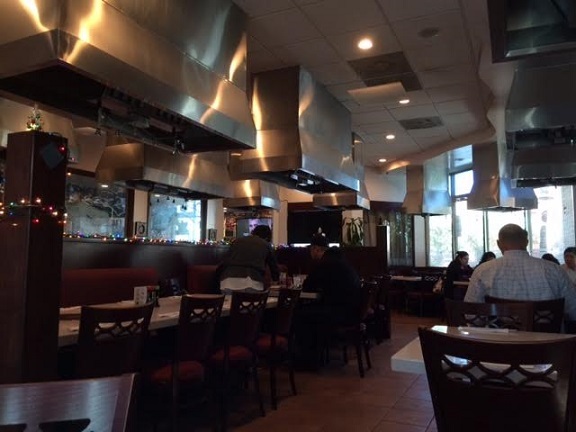 All the tables have heating elements on the top and range hoods overhead, and they seem like holdovers from a previous restaurant, as nothing on the menu looks like anything you would need to cook yourself, unless you decide your sushi is too raw. 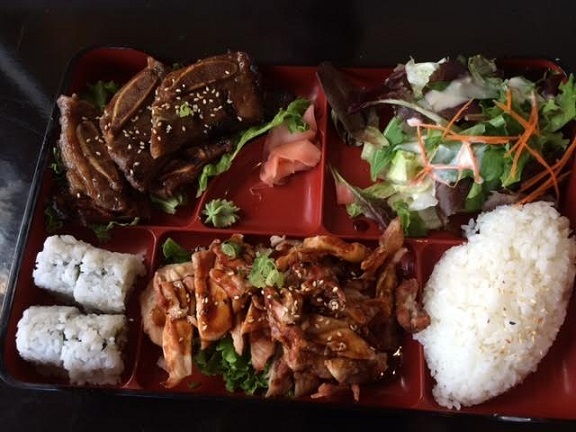 We got bento box lunches: sashimi and salmon teriyaki for him (top), nigiri sushi and garlic pork shogo yaki for me (above; $10 each). 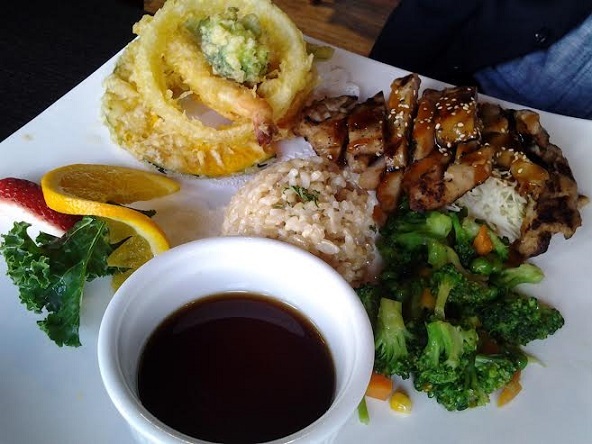 They came with small salads, fried tofu, a scoop of potato salad that was more like mashed potatoes, and orange segments, with a bowl of rice on the side and a bowl of miso soup to start. 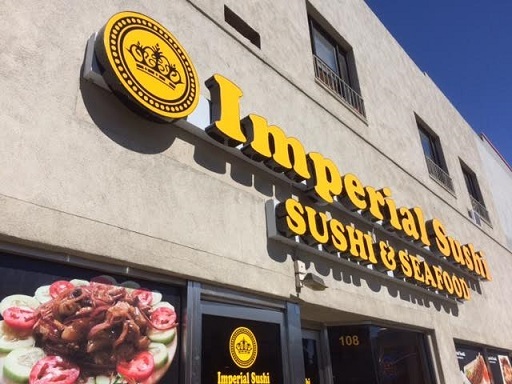 What we had was acceptable, but nothing special, and it didn’t live up to the current four-star Yelp rating. The fish was sliced a little thin and wasn’t outstanding. That’s not to say something else on the menu might not be very good; people on Yelp rave about the amount of fish in the chirashi bowl. The service was attentive and friendly. 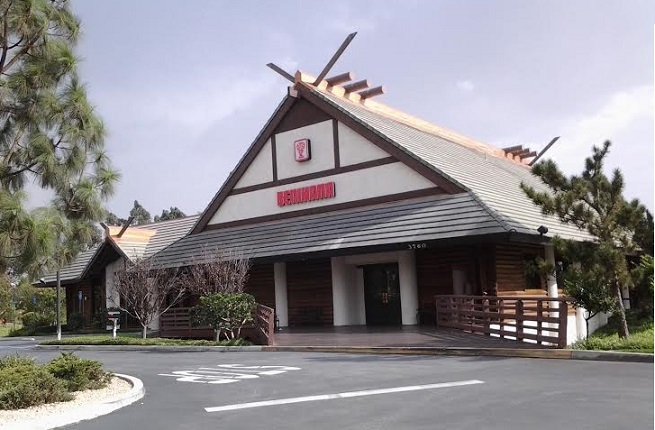 The restaurant doesn’t seem to be Japanese-run, which didn’t bother me or my friend, but might bother you. So, an okay spot, but unremarkable. 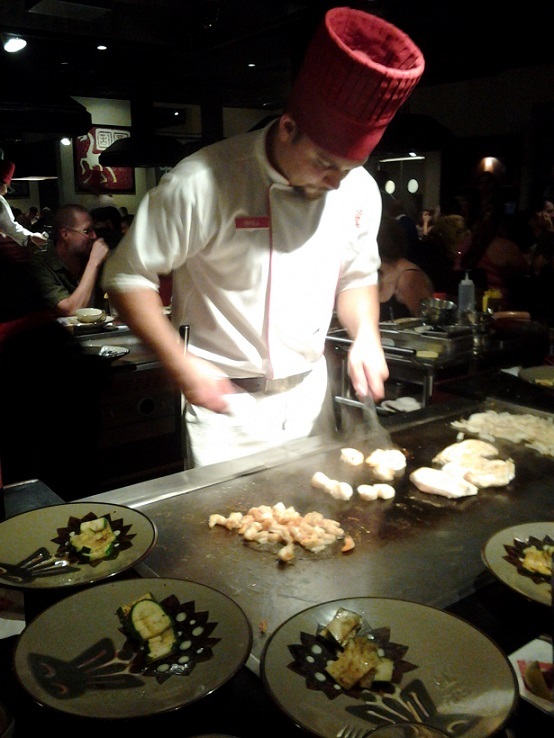 You could get sushi just as good or maybe a little better down the street at Benihana. Some people rave about the RA happy hour (3 to 7 p.m.); I went with friends a few years ago and wondered what the fuss was about. 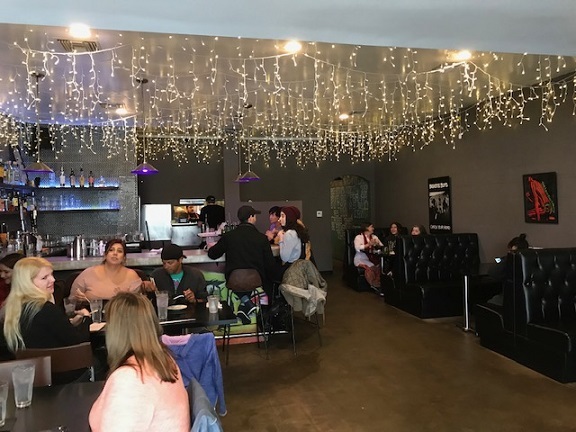 I suppose I’m kind of a purist about these things, and RA seemed too much like a party place, not a Japanese restaurant. 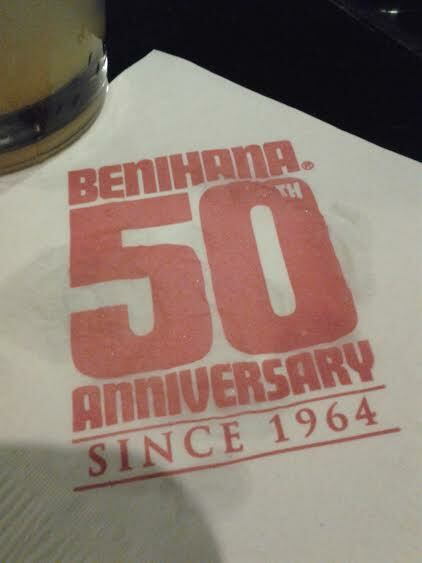 But a friend wanted to meet there recently for dinner, and so five of us converged on the Shoppes one Saturday night. It was warm enough that we got a table on the patio, which wraps around two sides of the wing-like exterior. Gazing into the distance, the green hills of Boys Republic across the way were visible, giving the sense that the mall was nestled in a rural area. Not entirely true, but not entirely false either. I do like the Shoppes, and there’s a Barnes and Noble a few paces from RA. We got a bunch of rolls, photographs of which I believe are in descending order below: lobster salmon ($13.45), with lobster, mango, avocado, cucumber, topped with salmon, lobster and lobster cream sauce; crazy monkey ($10.25), with smoked salmon, mango and cream cheese; Viva Las Vegas ($13.60) with crab, cream cheese, tempura batter, topped with spicy tuna, crab and piece of fried lotus root; and rainbow ($12), a California roll with tuna, yellowtail, shrimp, salmon and avocado arrayed “to look like a rainbow,” the menu explains. These were all pretty good, actually. 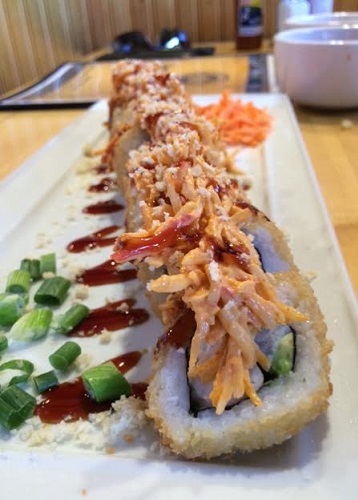 Viva Las Vegas with its crunchy and smooth textures was described by one person as the best specialty roll she’d had. 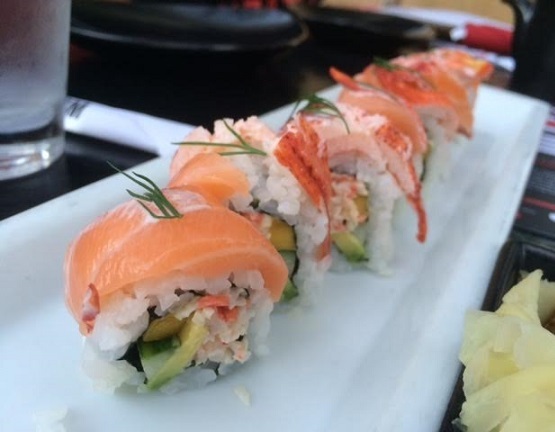 I don’t know if I had a favorite, but maybe the lobster salmon. I also had a scallop nigiri ($5), fine. There’s alcohol too. Somebody ordered the Umami punch ($18), 60 ounces (!) 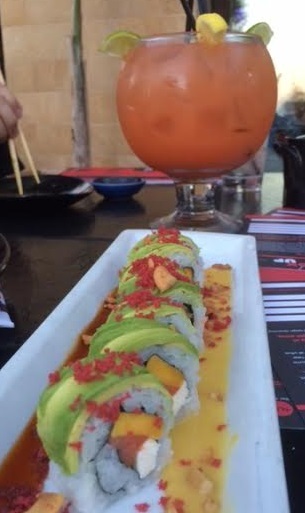 in a giant glass, meant for two; everybody had some. Even I took a couple of sips. 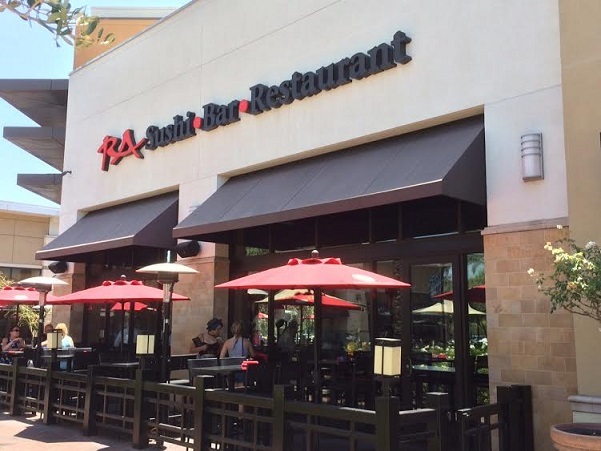 RA is still kind of a party place, by which I mean it comes off as the Yard House of sushi, but it proved a convivial spot to hang out with friends. The interior is snazzy. 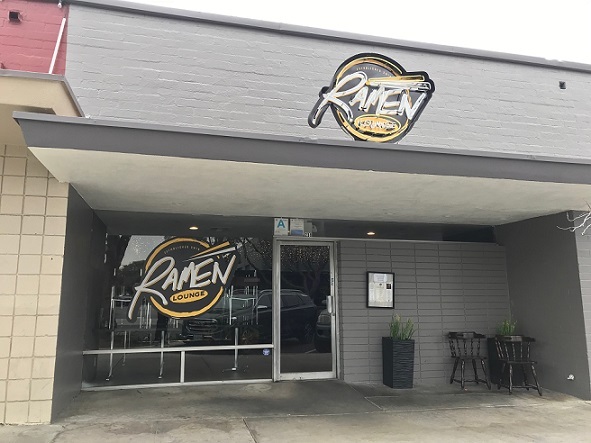 There’s better sushi in Chino Hills, which is to Asian food what Pomona is to Mexican food, but RA is OK.
Yugen is in a lackluster shopping center whose main tenants are a 24 Hour Fitness and a church. It’s also immediately south of the Ontario Police Department, which uses a defunct Fedco, behind acres of parking, as its headquarters. 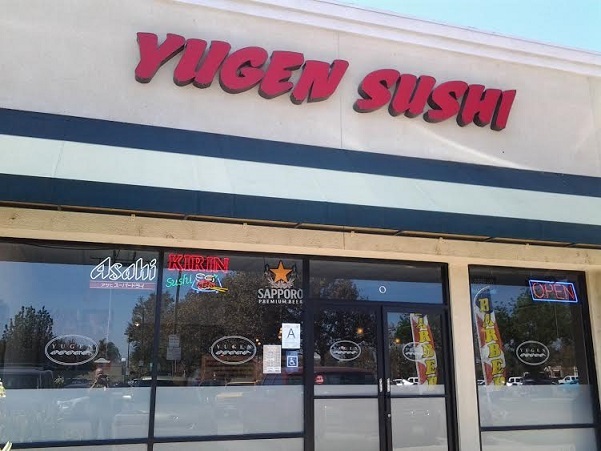 I didn’t see any cops inside Yugen, but surely some of them eat there (the ones not eating at Alina’s). The Yugen interior is simple and unpromising. A small aquarium is about the only item of interest amid the tiled floor and ceiling. I took a seat at the sushi bar and perused the menu. They have cheap sushi at lunchtime, $2 to $4 per order. 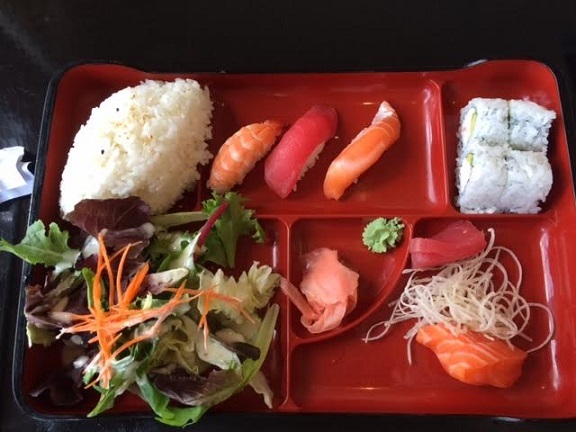 I opted for a combination plate with three pieces of sushi (pepper salmon, ono and albacore) and nine pieces of sashimi (yellowtail, tuna and salmon, three each), for $14; lunch included miso soup. 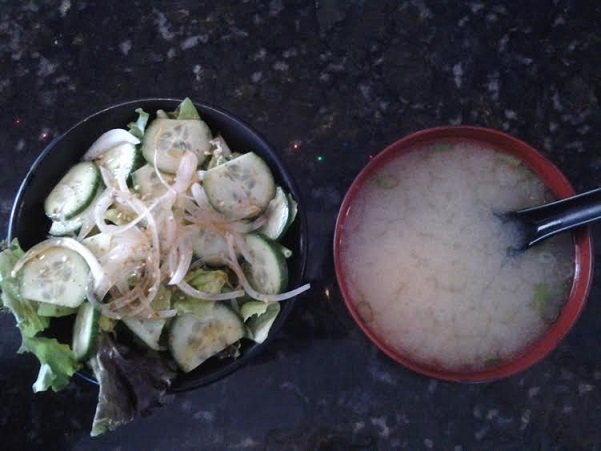 Not realizing I was getting soup, I ordered a cucumber salad ($3.75). The salad was larger than expected and tasty. 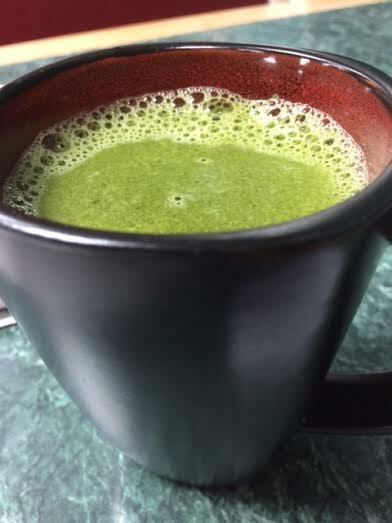 The soup was okay but had no seaweed. 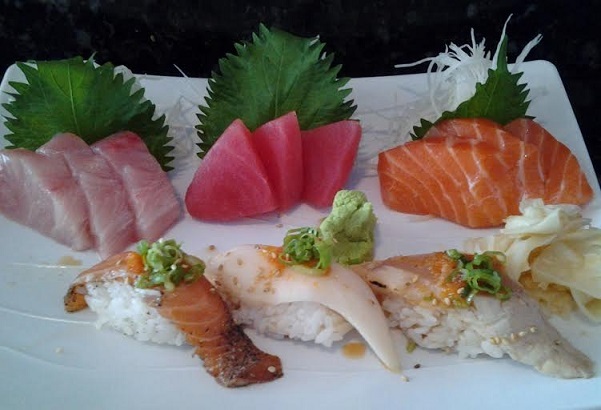 The lunch plate was impressive: the sashimi was cut thick, about one-third inch per piece. 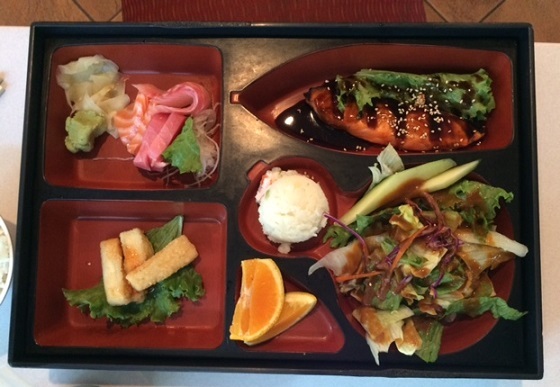 I liked it and the sushi too, especially the pepper salmon. 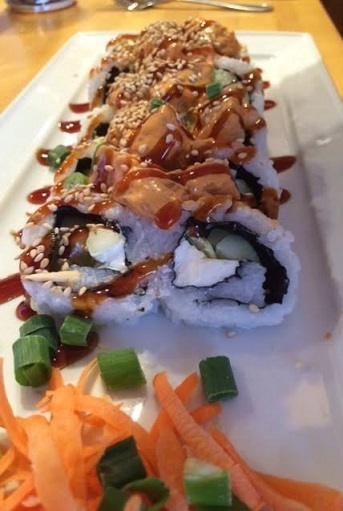 The sushi chef was low-key and helpful. Yugen was a pleasant outing, one of those nice finds in an otherwise dismal area where the main restaurants are Taco Bell and McDonald’s. 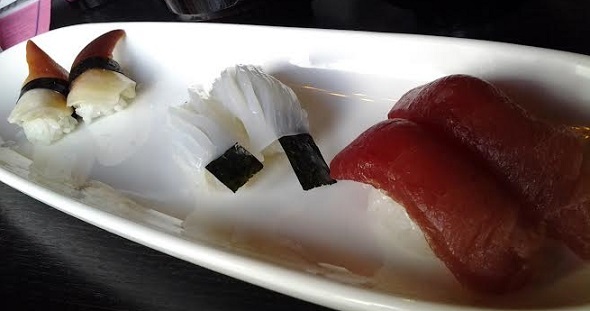 You can find better sushi — but maybe not in Ontario. 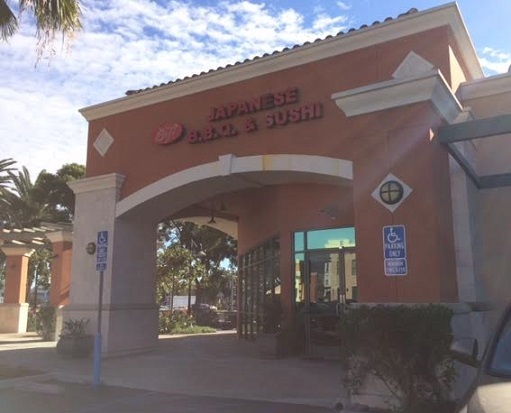 A former Italian restaurant that went through several incarnations (Spaghetti Eddie’s and Cucina Italiana among them) near Foothill and Haven is now reimagined as a Japanese restaurant and proving successful since its opening in January. A friend and I had lunch there a few weeks back. 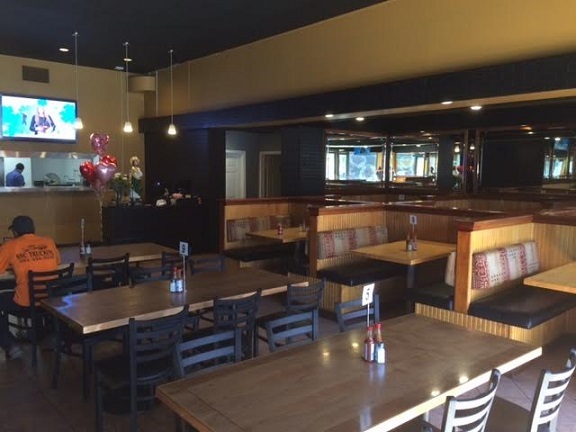 The interior is casual but slightly swank with modern decor and hardwood floors. 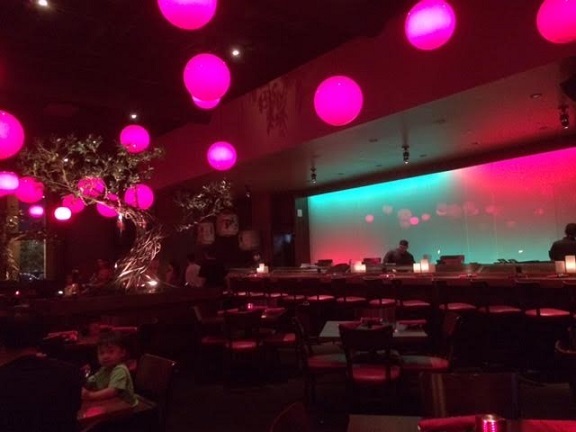 There’s a dining room with sushi bar, tables and booths and a lounge. Bottled beer, wine, sake and cocktails are offered. 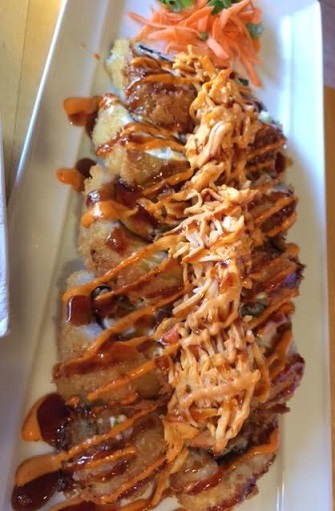 He had a combo of chicken teriyaki and vegetable tempura (bottom) and liked it; I had the all you can eat sushi ($20). 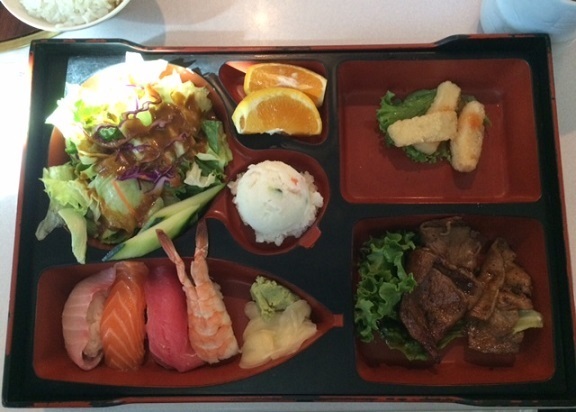 After a salad and miso soup, I had seven pieces of nigiri sushi and a cut roll, adding up to more than $20 worth of food. 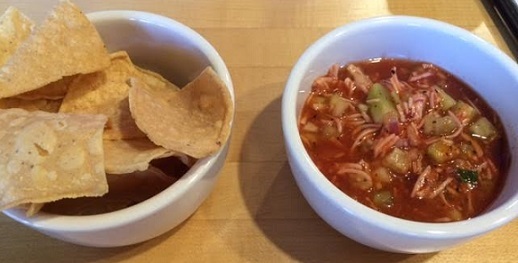 Below, left to right, is red clam, squid and tuna. 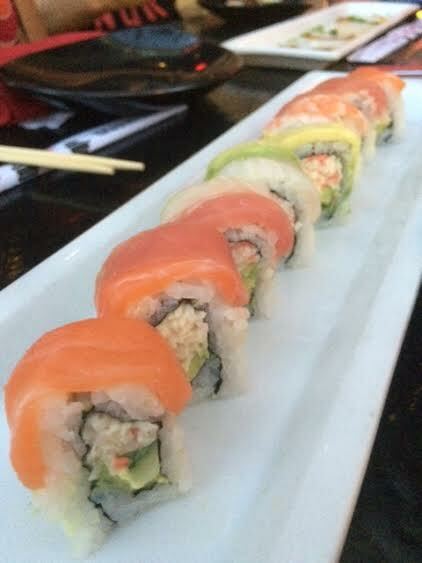 I also had salmon, shrimp, mackerel, scallop and a salmon skin cut roll, one of my standbys, and a good version too. 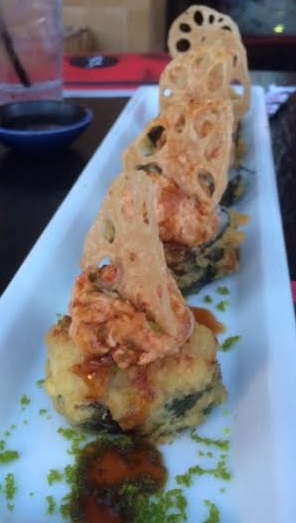 Some say the specialty rolls are better than the nigiri, but I rarely order those. 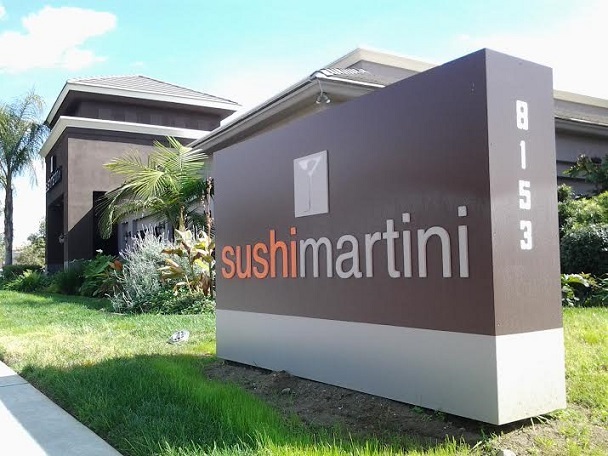 This was not the valley’s best sushi, but it was good enough, I’d rate it higher than nearby Omakase and Ken’s, and the deal was priced well. 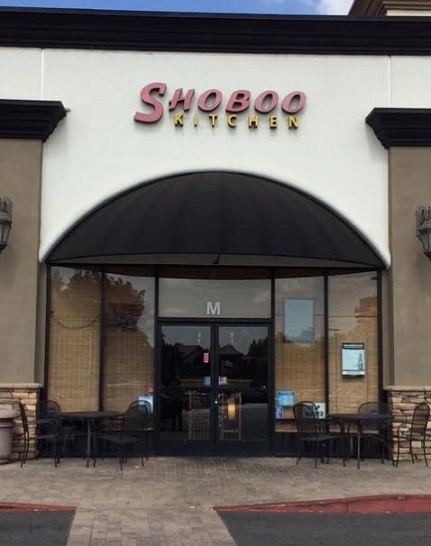 The atmosphere was comfortable and the service friendly. In other words, I would return.